- Flexfit® Adult 6-Panel Athletic Mesh Cap. - Structured, mid-profile, fitted cap with fused buckram sewn into front of crown. - 3½" crown with silver undervisor. 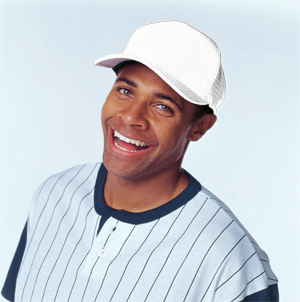 Flexfit® Adult 6-Panel Athletic Mesh Cap. 97/3% Polyester/spandex. Structured, mid-profile, fitted cap with fused buckram sewn into front of crown. 3½" crown with silver undervisor. Permacurv® visor. One size fits all (6 7/8"-7 3/8"). Colors: Black, Dark Navy, Kelly†, Maroon, Navy, Red, Royal, White. †Limited quantities.